out the next five years, Congress continued to pass joint resolutions designating a week in March as “Women’s History Week.” In 1987, after being petitioned by the National Women’s History Project, Congress passed legislation designating the month of March 1987 as “Women’s History Month.” Between 1988 and 1994, Congress passed additional resolutions requesting and authorizing the President to proclaim March of each year as Women’s History Month. Since 1995, Presidents Clinton, Bush and Obama have issued a series of annual proclamations designating the month of March as “Women’s History Month.” These proclamations celebrate the contributions women have made to the country and recognize specific achievements women have made over the course of American history in a variety of fields. In 2012, Obama proclaimed, “during Women’s History Month, we recall that the pioneering legacy of our grandmothers and great-grandmothers is revealed not only in our museums and history books, but also in the fierce determination and limitless potential of our daughters and granddaughters. As we make headway on the crucial issues of our time, let the courageous vision championed by women of past generations inspire us to defend the dreams and opportunities of those to come.” To learn about women’s role in the history of Colorado, visit the Center for Colorado Women’s History at Byers-Evans House, 1310 Bannock St. in Denver. It focuses on scholarship, research, lectures, tours and exhibits that expand the understanding and collective memory of the history of women in Colorado. Most importantly, the Center is connecting local stories to the broader stories of women’s history worldwide. It is open Monday-Saturday, 10 a.m.-4 p.m. and Sunday, 1-4 p.m. The Byers-Evans House has been the home to inspiring women since 1883. It has been beautifully restored to the era of 1912-1924 and is furnished with the Evans family’s belongings. Guided house tours weave together the stories of the many women who lived and worked in the home and the impact of the families on early Denver. Visit historycolorado.org and womenshistorymonth.gov to read more about women’s role in the history of Colorado and the United States. PRODUCTION DESIGN: Jeffrey V. Smith ADVERTISING	AD SALES: Jennifer Pund MMACadsales@gmail.com AD DESIGN: Jeffrey V. Smith CIRCULATION	Jennifer Pund Jeffrey V. Smith DEADLINES	AD SPACE: 20th of each month FREE LISTINGS: 24th of each month EDITORIAL CONTENT: 20th of each month Wideawake Media, Inc. P.O. Box 99, Rollinsville, CO 80474 OFFICE: 720-443-8606 | CELL: 720-560-6249 ONLINE ISSUE: issuu.com/wideawakemedia WEBSITE: MMACmonthly.com E-MAIL: MMACeditor@gmail.com MMACmonthly@gmail.com MMACadsales@gmail.com Wideawake, Colorado was a small mining district and townsite in Gilpin County near the head of Missouri Gulch on the southwestern side of Fairburn Mountain. By 1867 it was well-established with a population of hundreds. Corrections: We regret any mistakes, typos or otherwise incorrect information that makes it into the paper. If you find a mistake, please let us know so we can be sure not to make it again. All information contained in MMAC Monthly is subject to change without notice. 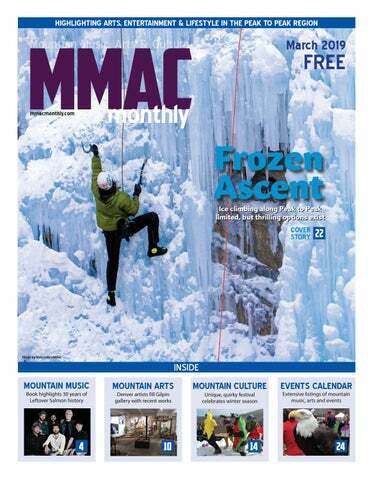 The MMAC Monthly is printed on paper made from up to 100 percent recycled, post-consumer waste and processed chlorine-free using soy-based inks and cold-set presses with very low Volatile Organic Compound emissions and high bio-renewable resources. Renewable, thermal, process-less printing plates made from aluminum and 100 percent recycled after use, are also used. 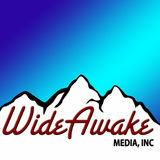 ©2018 Wideawake Media, Inc. No portion may be reproduced in any form without written permission from the publisher. Gold Hill Store & Pub is now open Friday and Saturday nights, 5-9 p.m. serving homemade pizza and various appetizers, wine, beer, and cocktails. Enjoy games, conversation, and fun, too. Watch for nightly specials. Daytime winter hours remain 11 a.m-3 p.m. daily. Visit goldhillstore.com or call 303-443-7724 to learn more. Join The Holistic Homestead for its twice monthly, year-round Farmers Market, March 2, 16, April 6 and 20, indoors at the Gilpin Community Center, 250 Norton Dr. The market continues on the first and third Saturday of each month. Find food, crafts, handmade and homemade items and live music. Call 303-5823001 or visit theholistichomestead.org to learn more. Library lovers of all ages are invited to meet Lyons Regional Library’s new Director, Rebecca Schuh. An informal meet and greet is at Oskar Blues, 303 Main St. in Lyons, March 3, from noon-1:30 p.m. Refreshments will be served. This event offers a casual opportunity for residents of the district to get to know her one-on-one before she dives in on March 18. Visit lyons.colibraries. org or call 303-823-5165 for more information. The Estes Valley Community Center, 660 Community Dr., hosts a four-week class series, “Cooking Classes for People who Don’t Cook,” on Mondays, March 4-25, 1-2:30 p.m. Seniors and active adults can learn to cook easy, but healthy, foods in a hurry using minimal equipment, ingredients, and prep time. The classes are free, but advanced registration is required. To register or learn more, visit evrpd.com, call 970-5868191, or stop by the community center. Estes Park Mayor Todd Jirsa invites community members to join him and his guest, Larimer County Commissioner Tom Donnelly, for a Mayor’s Chat, March 7 at 9 a.m. at Kind Coffee, 470 E. Elkhorn Ave. For more details, visit estes.org or call 970-586-5331. The Town of Estes Park invites community members to hear information and provide comment on the preliminary design alternatives for the Fourth Street Rehabilitation project at an open house, March 7, 4-6 p.m. at the Estes Valley Community Center, 660 Community Dr.. A project overview will be presented at 4:30 p.m. and concept drawings will be available for review afterwards. The project is expected to take place in May and June and consists of asphalt repaving along Fourth Street with the potential to redesign the current layout of sidewalks, parking lanes, traffic lanes and new bike lanes. Individuals who cannot attend the March 7 meeting are encouraged to review the concepts and meetings materials which will be available online by March 8. For more information, visit estes. org/FourthStreetRehab or call 970-577-3587. Franziska Stein, the original owner of the Black Bear Inn, returns to Lyons for a special book signing event, March 10, 3-4:30 p.m. at Lyons Middle Senior High School, 100 McConnell Dr. Her new book, “Chopin Through the Ages,” is a re-telling of her original autobiography about her remarkable life that began in Czechoslovakia when Hitler annexed it to Germany and continued with an incredible journey that eventually brought her to Lyons and Longmont and founding the original Black Bear Inn. Pick up a book and get it autographed. Contact LaVern Johnson at 303-823-5925 or lavern921@aol.com to order a book without attending. It costs $25 and postage is $4. Visit lyonsredstonemuseum.com for more information. Join the Stanley Hotel, 333 Wonderview Ave. in Estes Park, for a Masquerade Murder Mystery, March 22, 7-11 p.m. Attend the Billionaires’ Club Annual Masquerade Ball and help get this soiree back on track by trading clues with your guests, gathering information, and solving the crime before the masked menace gets away. Evening wear, ball gowns, Venetian masks, suits, and tuxes are what to wear to this high-class night of masks and murder. Tickets are $99 and include a meal, show and a complimentary wine or beer. To learn more, visit stanleylive.com or call 970-577-4000. The Saint Joseph Mobile Mammography Van hosted by Gilpin County Public Health returns to Gilpin County, March 25, 8:30 a.m.-3:20 p.m., at the Gilpin Community Center, 250 Norton Dr. Call 303-582-5803 to reserve an appointment or visit gilpincounty.org/ departments/public_health_agency to learn more. Join local women entrepreneurs and business owners, March 26, 7-8:30 p.m. for a monthly meeting to share wisdom, experience and business networking. at Hub Ned, 80 Big Springs Dr. in Nederland. For more information, visitpeaktopeakbusiness.com. ners with the Boulder Climbing Community and the Access Fund to monitor nesting progress and to inform climbers about the importance of giving the eagles space to raise their young. Federal and state laws prohibit disturbing any nesting bird of prey. Visitors can help protect wildlife by respecting all closures. Signs will be posted at key access points into the closed areas. Closure information will be available online at local climbing websites and at fs.usda.gov/goto/arp/eagles. Local talent hosts special open jam NEDERLAND Multi-instrumentalist and vocalist Thomas LaFond, founder of Boulder’s Banshee Tree, leads the weekly Pioneer Inn Open Jam, March 28, 10 p.m.-1 a.m. with a trio that incudes local musicians John Heiland of Seeing Stars Band and Shanti JAM ROCK/ Groove on mandolin and drummer Josh Raymer of Jacob Fred Jazz FUSION Odyssey. The trio, known to deliver high-energy dancing fun, will launch the night of freestyle music before opening it up to any player ready to join the jam. Combining the sounds of acoustic instruments with a diverse blend of EDM, jam, and early jazz, LaFond’s intrepid lyrics and compositions serve as a platform for hot swing and deep trance groove in his band. Heiland is known for heading into “unplanned territory” every time he plays. In Jacob Fred Jazz Odyssey, Raymer contributes “meta-modern drum stylings” that “push, pull and shake the foundation.” The Pioneer Inn, 15 East 1st St., hosts additional “Open Jams on Toast” with members of Nederlandbased act Electric Toast, March 7, 14 and 21. Visit nederlandpioneerinn.com or call 303-2587733 to learn more. remarkable gifts as a singer, songwriter, musician and performer demand attention. Her singing floats over the masterful playing and deep groove of her band with both a fierce intensity and tender intimacy. The Waydown Wanderers open. Tickets are $17 in advance and $20 at the door. Old Salt Union performs in the pavilion, April 19 at 8 p.m. The string band was founded by a horticulturist, cultivated by classically trained musicians, and fueled by a vocalist/bass player who is also a hip-hop producer with a fondness for the Four Freshmen. It is this collision of styles and musical vocabularies that informs their fresh approach to bluegrass and gives them an electric live performance vibe that seems to pull more from Vaudeville than the front porch. Tickets are on sale now at shop.bluegrass.com and 800-624-2422. Visit bluegrass.com to learn more about Wildflower Pavilion concerts as well as all events at the Planet Bluegrass Ranch, 500 West Main St. in Lyons, including the 47th RockyGrass Bluegrass Festival, July 26-28, and the 29th Rocky Mountain Folks Festival, Aug. 16-18.
eadow Mountain released its self-titled, debut album, Meadow Mountain, in November 2018. Produced by Chris Pandolfi of The Infamous Stringdusters, the album was released on Tape Time Records , a label curated by The Infamous Stringdusters. Recorded in Denver at Mighty Fine Productions, the 11 tracks on the album showcase the band’s wide array of musical influences, culminating in a powerful and unique acoustic sound. Meadow Mountain—comprised of Summers Baker on guitar, Jack Dunlevie on mandolin, Ian Parker on violin and viola, George Guthrie on banjo, and Wilson Luallen on bass—are a band in the true sense of the word. Their music plays to each members’ individual strengths, and the finished product is a style of music rooted in traditional, harddriving bluegrass. “In a world of constant string band evolution, Meadow Mountain has distinct ties to all the best elements of bluegrass, which really makes them stand out from their peers,” Pandolfi said. “They combine that with really strong songwriting chops to create a unique sound that fans of acoustic music will surely gravitate toward.” From start to finish, the album creates a synergy of old and new musical concepts. “Careless Heart”, the opening track, features a hard-driving, classic bluegrass sound, showcasing their deep connection to the traditions of the genre. Each song on the album shows the range of the group’s ability to bend tones and styles of bluegrass instruments to create something completely original. Meadow Mountain has become one of the premier voices in the Colorado bluegrass scene and in 2017 solidified its reputation by winning first place in the RockyGrass Band Competition. With the release of the debut album, there is “new excitement” in the band. Meadow Mountain is available for purchase or steaming on a wide range of online music platforms. Visit meadowmountainmusic.com for more information. features music by The Angle, Avenheart, Thin Air and The Jauntee from 12:30-7:30 p.m. The Bacon, Bourbon & Brews Tent has live music on Saturday from 11 a.m.- 10 p.m. from Emma Mayes & the Hip, What About Jim, Black Dog Friday, Woodshed Red, Dead Pay Rent and PJ Moon & the Swappers. On Sunday, from 12:30-7:30 p.m., the tent features Card Catalog, Wood Belly, Shady Grove and the Electric Money Orchestra’s Almost Brothers Band featuring Smooth Money Gesture and Electric Toast. The Not Yet Dead in Ned Tent, highlighting local acts, has music from 11 a.m.-10 p.m. on Saturday from Strangebyrds, Flash Mountain Flood, Banshee Tree, Electric Toast, Power Lung Rangers and Astro Cat. A “Tweener Stage” behind the tent includes sets from the Burney Sisters and Ned & the Dirt. On Sunday, music in the tent runs from noon-7:15 p.m. and includes sets by The Gael, Seeing Stars, New Family Dog and Green Buddha. The Tweener Stage features Lucas Wolf, JW Schuller Trio and Eric Richard Stone. Around town on Saturday, check out Fists of the Proletariat for free on the Clock Tower Collective patio, 112 E. 2nd St., from 2:30-4 p.m. and 4:30-5 p.m.; Adam Hunt for free at Very Nice Brewing from 6-8 p.m.; The CBDs at Kathmandu Restaurant, 110 N Jefferson St., for free at 7 p.m.; and Sleazy Grease at the Pioneer Inn, 15 E. 1st St., at 10 p.m. for a $5 cover. J.W. Schuller Trio performs at the Clock Tower Collective on Sunday from 1:45-3:15 p.m. and Snowbound Hounds play Very Nice Brewing from 4-6 p.m. Visit frozendeadguydays.org or venue websites for a complete schedule and details. Avenue and Pixie and the Partygrass Boys. The band is “excited” to be able to offer a wide-range of accommodations to Boogie At The Broadmoor attendees including a variety of suites, cottages, brownstones and even a 12,000 square foot Estate House. An opening reception with Woodshed Red, nightly costume themes, vendor village, pop-up picks, morning yoga, poster art show and sale, sponsor booze cruise, fashion show, the gong show, boogie lounge open jam and a book presentation with Boogie MC Tim Newby are also included in the event. Full weekend passes are $220 plus fee. Single days tickets are $69 for Friday, $89 for Saturday and $69 for Sunday. Tickets to Nitty Gritty Dirt Band only are $35. All tickets for students under 21 with valid ID are half off. Tickets and rooms are available at Boogieatthebroadmoor.com and will not be available at the door. For more information about this and other tour dates and events, visit LeftoverSalmon.com. CENTRAL CITY he Gilpin County Arts Association features the work of Walter Barton and W. Max Thomason in “Just Between Us,” one of its first wintertime exhibitions in the newly heated, and recently repainted, Washington Hall Gallery, 117 Eureka St. The life-sized sculptures and large-scale oil paintings can be viewed through May 3 during gallery hours, 11 a.m. to 4 p.m., The Washington Hall Gallery’s walls Friday-Sunday. A closing reception is planned for May 3 from 5-8 p.m. are filled with paintings by W. Max Thomason is a Denver-based artist that works in the natural-realism, abThomason (above). The Grindstone is one of several paper maché and foam stract and, at times, pop genres. He is known for his large-scale canvases. sculptures by Walter Barton (right). From 1990-96, he studied under Amy Métier at Metropolitan State UniverPhotos by Jeffrey V. Smith sity of Denver and University of Colorado Denver. The greatest influence on his early painting years were the Fauvists of the early 1900’s and the realists of the 1960s and 70s. He’s participated in multiple group and solo exhibits to date in Colorado, Louisiana, Florida, New York and Austria . He is also the owner of Bitfactory Gallery and Bitfactory Studios. “I have long been intrigued by color, depth of perception, and things moving in and out of focus, both literally and figuratively in society; and the effect, in both the literal and figurative sense, they have on a person and the psyche,” Thomason said. “Color and focus are the cornerstones of this exhibition, and I hope will be the inspiration for a dialogue of how we as humans interface with each other and our surroundings as we go through the minutiae of daily life.” Barton, another Denver native, began his training at Parsons School of Design in New York City. After his first year, he served a bronze casting appren­ticeship with David McGary in Ruidoso, NM before getting a BFA at Maryland Insti­tute, College of Art in Baltimore. He later received a Masters in Humanities from CU Denver. He is a member with the Pirate Contemporary Art Gallery located in Lakewood and an arts teacher at the Cherokee Trail Elementary School in Douglas County. “In my work I am inves­tigating archetypes of memory and myth. My process is an intuitive response to materials and images in my environment as I engage in a search for identity and meaning,” Barton said. “Conceptually, I am attracted to the sediment of the human psyche, the heritage of ancestral motifs and perceptions filtered through modern society, while situated in the geology and history of the American West.” W. Max Thomason’s paintings For more information, call the gallery during operating hours at 303-582-5952 or visit GilpinArts.org. Local theater company premiers new musical NEDERLAND The Peak to Peak Players theatre company premiers Call Me Ned, a one-act Frozen Dead Guy Days musical, March 9, 11-11:45 a.m. and 4-4:45 p.m. as well as March 10, 11-11:45 a.m. at the Backdoor Theatre, 750 Hwy. 72 N. There is no charge, but donations are requested. THEATER Written by Patrice LeBlanc, who is also the musical director, and Ed Schoenradt who is also the director, the new, original musical explores the notion of what would happen if the Frozen Dead Guy accidentally came back to life. It is has six scenes, six musical numbers and includes audience participation. Visit peaktopeakplayers.com or e-mail admin@ peaktopeakplayers.com for more details. CENTRAL CITY The Mountain Heart Gallery, 115 Main St., offers a Beginning Book Folding Techniques Class to teach participants fascinating folds that make books works of art. The fee is $50 and all supplies included. Search for Mountain Heart Gallery on Facebook or call 720-612-8734 to sign up and learn more. caught cheating every place he goes.” Mitchell says the gambler “realizes he’s going to have to keep it kind of under wraps for awhile.” He has a partner who is a fortune teller and they “work together to find suckers and set them up with these illegal gambling spots.” There’s also a hero—County Commissioner Jerry Mander—and assorted other characters who produce a plethora of puns and jokes that keep audiences in stitches. The play is always a load of laughs, but its purpose is serious. It raises money for the mission work of the church with all proceeds divided among Lifelong Learning of Estes Valley, Crossroads Ministry, and Estes Park Crisis Advocates. In recent years the melodrama has been a sellout. There are enough seats for about 120 people, so get tickets early. Adults are $10 in advance and $12 at the door. Children 12 and under are $5 each. Tickets can be purchased at Macdonald’s Book Store or in the church office. Visit estesparkpresbyterian.org or call 970586-4404 to learn more. students to practice what they learned, is April 18. A fourth session, which focus on the Waltz and Swing dances, take place from April 25-May 16 with a “social” dance on May 23. The classes take place on Thursday nights, 6:30-7:30 p.m. Each session is $65 per couple or $50 per individual for residents and $75 per couple or $65 per individual for non-residents. Child care is available from 6-8 p.m. for $3 for children ages three and up. More Ballroom dance classes are offered by Dysart at Charlie’s Bar, 118 Main St. in Central City, through May. The classes are on Fridays, 6:30-7:30 p.m. The first four-week Ballroom dance session of Ballroom dance classes takes place, March 1-22. A second session runs for four Fridays, April 5-26, and a third session takes place on Fridays, May 3-24. Each session is $60 per couple or $40 per individual. Dysart’s Burlesque classes at Charlie’s Bar are for female-identified individuals age 21 and older and take place on Fridays, 8-9 p.m. The first session runs from March 1-22. A second session runs for four Fridays, April 5-26, and a third session takes place on Fridays, May 3-24. Each session is $40 and individual classes are $12 each. Sign up for the dance classes and learn more about Dysart, her adult offerings and many classes for children—including ballet, tap, hip-hop, acrobatics by visiting lacommunitydance.com. Hotel hosts pool party ESTES PARK The Ridgeline Hotel, 101 S. Saint Vrain Ave. hosts a Winter Pool Party, March 23, 6-11 p.m. Bring the family and dive into the spacious indoor heated swimming pool. March Madness games will be SPECIAL shown on a 180-inch screen. EnEVENT joy a special menu of burgers, bratwurst hot dogs and mac and cheese, along with drink specials for guests age 21 and older. Visit ridgelinehotel.com or call 970-586-2332 to learn more. NEDERLAND All winter warriors are called to experience Subaru WinterFest, March 22-24, at Eldora Mountain Resort, 2861 Eldora Ski Road, before winter calls it quits. The event, with no extra cost, features live music, giveaways, s’mores, demos and more. As a partner of Eldora, Subaru beSPECIAL lieves in “embracing winter advenEVENT ture because their passion for the outdoors doesn’t hibernate.” That’s why they’ve created Subaru WinterFest, a one-of-a-kind mountain destination and lifestyle tour where skiers and snowboarders can come together and share their passion for all things winter. Enjoy live music by Trout Steak Revival on day one, Lukas Nelson & Promise of the Real on day two, and The Lil’ Smokies on day three. Relax while enjoying s’mores, craft coffee and SiriusXM. Participate in daily giveaways and test the latest gear from Nordica, Lib Tech, Thule, Klean Kanteen and more. For details, visit eldora.com or call 303-440-8700. Not Ready to Hit the Slopes? Not a Problem For guests who aren’t ready to give skiing or snowboarding a try, or families with both skiers and non-skiers in tow, ski areas offer dozens of family-friendly non-skiing activities. Ride a mountain coaster, take a guided snowshoe tour, ice skate on a pond or experience a gourmet dining experience. Spring is Prime Season for Après Colorado’s spring skiing conditions are worldclass and the spring après-ski scene is even better. Ski areas offer plenty of options to occupy skiers and riders after the lifts have closed, from sunny patios and relaxing environments to live music and festivals. Don’t Forget the Sunscreen Skiers and snowboarders should be mindful of sun exposure all season, but it’s especially important in the spring. With blue skies and longer days, sunscreen can help avoid the sunburns. Reapplying sunscreen mid-day is highly recommended. Find End-of-Season Deals on Gear and Equipment Spring is the perfect time to stock up on skiing and snowboarding gear, when ski areas and ski shops alike offer end-of-season deals to make space for next season’s inventory. Guests can find bargains on everything from skis and snowboards to soft goods like outerwear, base layers and gloves. American Legion Post 119, Lumpy Ridge Brewery, Elkins Distilling Co. and the Estes Arts District host a Fat Tuesday Mountain Mardi Gras Party, March 5 from 6-10 p.m. at the American Legion Hall, 850 N. Saint Vrain Ave. The evening NEW features a gumbo cook off, ORLEANS live music, craft beverages, beads and party favors, costume contest, King Cake and more. The event is open to the public with a $5 cover that includes a shot. The centerpiece of the event is a Gumbo Cook Off at 7 p.m. with judges to select the best and most authentic gumbo. First place wins $100, second place takes home $75 and third place gets $25. Anyone interested in participating or wanting more information about the cook off, can e-mail greg@gregmilesart.com or estespost119@hotmail.com. A minimum of three gallons of gumbo is required. Rice will be provided. Participants may also sell their gumbo. The Really Most Sincerely Dead Band, a “lively crew of seasoned musicians, grateful to still be rocking,” perform during the event. According to band members, they have prepared plenty of “Big Easy appropriate songs in addition to the usual craziness.” Lumpy Ridge Brewery and Elkins Distilling Co. are selling craft beverages, including Hurricanes. Attendees are encouraged to wear costumes to participate in a costume contest with “fun” prizes. The event also includes red beans and rice, Mardi Gras beads, party favors, and King Cake from Troy and Angie Koehler, owners of the Erin Rose Pub in the French Quarter of New Orleans. Proceeds from the evening support the mission of the American Legion Post 119, which provides a support network for Veterans and their families. Visit estesartsdistrict.org and esteslegion. org for more information. Lodge, a stunning mountain resort set two miles from Yosemite National Park and surrounded by noble evergreen forest, in Fish Camp, California; and a trip to Old Faithful Cabin in West Yellowstone, Montana. Clustered in five camp settings, this 50-cabin property provides a sense of community without compromising privacy.. The generosity of major and associate sponsors makes the race possible, said Bill Solms, who led the sponsorship effort. A major sponsor contributes $500 or more in cash or services to support race prizes. An associate sponsor kicks in $100 in cash or services. The MMAC Monthly is a major sponsor this year. The goal for 2019 is to raise $135,000 or more in duck adoptions that will benefit the participating organizations selling them. For each $20 adoption form sold, $19 goes to the beneficiaries. In the past 30 years, the Estes Park Duck Race has returned more than $2.6 million to the Estes Valley. Visit epduckrace.org or call 970-480-5002 for complete details. Fight childhood cancer GILPIN COUNTY A volunteer-organized head-shaving event to raise funds for the St. Baldrick’s Foundation, a volunteer-powered charity that funds childhood cancer research grants, takes place at Gilpin County School, FUND10595 Hwy. 119, March 21. RAISER Time to be announced. Whether you shave your head, volunteer or pledge to donate, organizers hope “you’ll be a part of the excitement.” Visit stbaldricks.org or e-mail Kevin Armstrong at crash8001@msn.com to learn more. 1st St. beginning at noon. This popular spectator event has thousands of people lining both sides of the street to see the spectacle. For this year’s festival, organizers recruited five long-time Nederland residents who characterize the eclectic community and have helped put it on the map. Bunny Spangler, Barbara Hardt , Chris Perret, Eric Mix and Greg “Toastie” Post will all have honorary positions at the head of the parade. The Costumed Polar Plunge—where an assortment of outrageously dressed participants jump into a large, icy swimming pool—is up next in Guercio Field from 1-2 p.m. Entry is $10 and prizes are awarded for best and runner-up costumes, plus for the most impressive team plunge. Best costume wins an Eldora 2019-20 season pass. Half of all proceeds go to support TEENS, Inc.’s Outdoor Leadership Program. The Coffin Races, also in Guercio Field from 2-3:30 p.m.,features teams racing with a coffin and “corpse” through a course full of obstacles, mud, snow, drills, and other racers. Prizes are awarded for best time team, runner up time team, best theme, and most notable snafu on course. Entry is $75 a team. New this year, the former Brain Freeze tent on East 1st Street has been renamed the Not Yet Dead in Ned Tent and features music, art and more by Nederland residents along with craft beer from Upslope Brewery, locally-distilled spirits, 12 live bands over two days and live painting. Also, the Bacon, Bourbon & Brews tent, which features 12 bands over two days, has been relocated to Guercio Field next to the ReAnimate Tent. Entry into all three tents for two days, including 30 live bands, craft beer and spirits, artists, vendors, and more, is $20 at the door of any tent. During the event, particpants may also take part in Snowy Human Foosball, Frozen Fix-a-Flat, The Newly Dead Game and more as well as watch Ice Sculpting, Hawkquest vultures and bald eagles, “Grandpa’s in the Tuff Shed” documentary and the new musical, “Call Me Ned,” by the Peak to Peak Players in the Backdoor Theatre. New this year is a Hot Wing Trivia contest on Saturday from 5-6 p.m. at Ned’s, 121 N. Jefferson St. Down fiery hot wings while answering three trivia questions for fabulous prizes. Entry is $7. Anyone wishing to participate in any of the contest of main events must sign a waiver and pay an entry fee, when applicable, to participate. Registration and wristband pick-up is in the Teen Center on Saturday from 9 a.m.-noon and at each smaller event location. Although much of the festival is free or included with the $20 tent wristband, VIP passes are available for $175 and include entry to all tents and the Blue Ball, VIP parking, a swag bag, free participation in all contests, VIP viewing for Coffin Races and Polar Plunge, VIP party bus with snack lounge and fire pit, access to VIP portable toilets and a bottomless VIP cup, good for all beverages, all weekend at all tents. Find a complete schedule of events and music, complete festival details as well as advance registration for contests online at frozendeadguydays.org. For more information, call 303-506-1048 or e-mail frosty@frozendeadguydays.org. Dinner features Irish theme NEDERLAND The Mountain Peak Life group hosts a special Saturday night “social dinner” with an Irish theme, March 23, 5-7:30 p.m., at the Nederland Community Center, 750 Hwy. 72 N. Meet active mountain residents over a fine dinner IRISH prepared by Head Chef Cher Rainbolt. Dinner is $10 for adults under age 60 and $5 contribution for those age 60 and older. Reservations are required. The menu for March has an Irish theme and in includes Irish lamb stew, black and wild rice salad with roasted squash, soda bread and Baileys cheesecake. Peak Life dinners are committed to serving high-quality foods “lovingly prepared for optimum health and flavor.” Visit meetup.com/MountainMidLife-Social-Group or e-mail serenekarplus@gmail.com for details and to sign-up. Request special dietary needs when making a reservation. cheese. The fourth course is cod fish al ajillo with cilantro rice and course five is carlota with frozen creamed butter, pineapple and tequila. Mojo Taqueria serves fresh Mexican food, drawing on flavor of Oaxaca, Yucatan, Baja, and other regions of Mexico. Everything starts with highquality ingredients and is made from scratch. Reservations are required and space is limited. Call 303-823-2321 to make a reservation, or fill out the form at mojotaqueria.com/tequila-dinner. ery, 470 Prospect Village Dr.; Big Horn Restaurant, 401 W. Elkhorn Ave.; Cafe de Pho Thai, 225 W. Riverside Drive; The Grubsteak, 134 W. Elkhorn; La Cabana Bar & Grill, 165 Virginia Drive; Snowy Peaks Winery, 292 Moraine Ave.; Hunter’s Chop House, 1690 Big Thompson Ave.; Cinnamon’s, 920 W. Elkhorn; Cousin Pat’s Pub & Grill, 451 S. St. Vrain; The Wild Rose, 157 W. Elkhorn; Himalayan Curry & Kebob, 101 W. Elkhorn; La Cocina de Mama, 361 S. St. Vrain Ave.; Chipper’s Lanes, 555 S. St. Vrain Ave.; Burgers & Gyros on Moraine, 861 Moraine; and Rocky Mountain Deli, 541 Big Thompson Ave. For more information, visit estesparkdinearound. blogspot.com. great items donated by local businesses. Attendees also hear from past scholarship recipients about how they used their scholarships to pursue their college careers. The evening’s program features John Bandimere, Jr., a second generation owner and operator of Thunder Mountain. The Bandimere Speedway has been entertaining millions with drag racing since 1958. They also sponsor the Race to Read program every year. Hear about Bandimere’s entrepreneurial spirit and successful family business. All dietary restrictions will be met, e-mail gilpinfoundation@gmail.org with special requests. Visit gilpineducationfoundation.org to learn more about the foundation, its scholarship programs and other ways to contribute to local education. Boulder Theater • Pearl Street Mall Info Kiosk... and more. ce climbing in the Colorado Rockies can be an amazing experience. Each winter many Colorado rock climbers become ice climbers while others travel long distances to take advantage of our state’s ice. The sport includes variables like the cold weather, a complex and interesting climbing surface and some odd equipment, but it’s not unlike regular rock climbing; offering the same “natural high” and sense of accomplishment at reaching the top. Equipment can even be the same, with some variations and additions. Ice Climbing is the activity of climbing ice formations including icefalls, frozen waterfalls, rock slabs covered in ice, and cliff sides frozen with water. Ice comes in all formations from soft to hard and the climbing grades differ from that of rock climbing. Mixed climbing is the combination of climbing both rock and ice. Like all roped climbing, beginners should never ice climb alone or attempt to climb any ice they are unsure about. Most people make the transition from rock to ice, but it’s possible to learn on ice, with the proper instruction. When learning a dangerous sport like ice climbing, guides or professional instruction is key, not only for safety, but also to ensure the experience is enjoyable. A good guide book and website resource is also helpful to find suitable climbs. Rock climbers find ice climbing to be more about balance and finesse then strength. People with a background in gymnastics or dance generally find the sport easier to learn as do those who play racquets sports due to being used to the wrist motion necessary to use an ice tool. Necessary equipment includes a helmet, harness, boots, front-point crampons, tools, rope, belay device, headlamp, pack and an ice climbing rack. Warm layers of clothes are also needed. The harness is one of the most important pieces of gear to consider for safety and comfort. Almost any climbing harness will do, but ice-specific options exist. Ice climbing harnesses feature more adjustability to fit over thicker layers, slots to carry screws and holster tools and padding designed to repel moisture. Also, don’t confuse ice tools meant for climbing with ice axes used for mountaineering. Ice tools have a reverse curve shape that makes it easier to pull it out of the ice. For experienced ice climbers who don’t need instruction and have a knowledgeable partner, the Peak to Peak area offers limited options for ice climbing, with the exception of Clear Creek Canyon on the southern end and Rocky Mountain National Park, which offers a number of world-class climbs—including Hidden Falls which features an approximately 75-foot column of ice—on the northern end at Estes Park. Climbable ice can also be found in Boulder Canyon and near the Moffat Tunnel in Rollinsville, but many ice climbers will not find either worth the effort, especially later in the season, which generally runs from January to March depending on conditions. Ice can be particular and ever-changing. Warm temperatures are obviously not good, but so are temperatures that are too cold. Ice climbing in Boulder Canyon dates back decades as water used to flow in from a variety of sources, including leaks in the aqueduct leading from Barker Reservoir in Nederland. Repairs and other changes have left few options today. The canyons popularity with rock climbers and proximity to Boulder make for a busy area. Clear Creek Canyon provides ice climbing during the winter. Its frozen flows range in difficulty and length perfect for all levels of ability. Guide and outfitters offering ice climbing instruction often use locations in the canyon. Several sites along U.S. 6 between Golden and Black Hawk produce fun ice climbs in a casual setting. All of the climbs can be top-roped or make great places for beginner leads. Its proximity to Denver, however, can lead to crowded routes. Rocky Mountain National park offers dozens of ice-climbing routes that provide a scenic setting, outstanding views and a variety of routes. One of the most popular is at Hidden Falls in the Wild Basin area. The park is also a great location for mixed rock and ice climbing. The Bear Lake Trailhead provides access to several ascents around Loch. Climbs in this area include a mix of rock, snow and ice, with a final push up a hanging ice curtain. Estes Park-based Colorado Mountain School has the longest history of running climbing programs in the park and is a great place to start. The school offers an Introduction to Ice Climbing Course at Rocky Mountain National Park locations on Saturdays through March. It is a perfect one-day introductory course covering all the basics of ice climbing with highly-trained guides. Advanced Ice Climbing, Vertical Ice Climbing and Mixed Climbing courses are also offered in Estes Park. Visit coloradomountainschool.com or call 720-387-8944 for information. No matter what your level of ability, for peace of mind while exploring remote areas or undertaking challenging activities, consider purchasing a Colorado Outdoor Recreation Search and Rescue (CORSAR) Card. Visit colorado.gov/pacific/dola/searchand-rescue-fund to learn more and purchase a card. By purchasing a CORSAR card, you contribute to the Search and Rescue Fund, which will reimburse these teams for costs incurred in search and rescues across the State of Colorado. The CORSAR card is available for $3 for a one-year card and $12 for fiveyear card. To learn more about most all climbing areas in the state, visit mountainproject.com. BUFFALO RESTAURANT/ WESTBOUND & DOWN 1617 Miner St. • 720-502-3121 • westboundanddown.com 3/13, 3/27 Kind Mountain Band. 6:30 p.m. Free. 3/1-2 DJ M. Groove. 9 p.m.-2 a.m. Free. 3/8-9 DJ Tanastadi. 9 p.m.-2 a.m. Free. 3/15-16 DJ Dizzy D. 9 p.m.-2 a.m. Free. 3/22-23 DJ Brian Howe. 9 p.m.-2 a.m. Free. 3/29-30 DJ Petey. 9 p.m.-2 a.m. Free. 3/8 The CBDs. 7-9 p.m. $. 3/2, 3/16, 3/23, 3/30, 4/6, 4/13 Hip Hop Night. 9 p.m.-1 a.m. Free. Sundays through 4/28 Karaoke w/Heather Taylor-Lande & All Service Industry Night. 7 p.m.close. Free. Fridays Dam Jam Open Jam. 9 p.m. Free. 3/1 The Symbols Stompit. 10 p.m. Free. 3/5, 3/19, 4/2 Open Mic w/Jon Ridnell. 9 p.m. Free. 3/7, 3/14, 3/21 Open Jam on Toast. 10 p.m. Free. 3/8 Part & Parcel. 10 p.m. $5 3/9 Sleazy Grease. 10 p.m. $5 3/12 Open Mic w/Dan Perez. 9 p.m. Free. 3/15 Moves Collective. 10 p.m. Free. 3/23 Tahosa. 10 p.m. Free. 3/26 Open Mic w/Dan Perez. 9 p.m. Free. 3/28 Open Jam w/Thomas LaFond & Josh Raymer. 10 p.m. Free. 3/30 Alfonzo, Marshall & Darby. 10 p.m. Free. 4/4 Open Jam w/Squid Philliams. 10 p.m. Free. 4/6 Kaleid. 10 p.m. Free. Wednesdays Blues Night. 10 p.m. -1 a.m. Free. 3/5 Lyons High School Jazz. 7:30-8:30 p.m. Free. 3/8 Good Manners. 8:30-11:30 p.m. $5. 3/9 Blue Canyon Boys. 8:30-11:30 p.m. $5. 3/10 Felonious Smith Trio. 5-8 p.m. Free. 3/11 High School Jazz Jam. 7-8:30 p.m. Free. 3/15 Samba Tonk. 8:30-11:30 p.m. $5. 3/21 The Complete Unknowns. 8:30-11:30 p.m. $5. 4/19 Songs From The Road Band. 8:30-11:30 p.m. $5. 4/27 Bowregard. 8:30-11:30 p.m. $5 Tuesdays Bluegrass Jam. 7-10 p.m. Free. 3/1, 3/22, 4/5, 4/19 Karaoke, 9:30 p.m. Free. 3/1 Clay Rose & Kevin Matthews. 8:30-11:30 p.m. $5. 3/2 Lil’ Ween. 8:30-11:30 p.m. $5. 3/3 Bonnie & Taylor Sims. 5-8 p.m. Free. Wednesdays, Fridays, Saturdays Karaoke Night. 9 p.m. Free. 3/15 Cassie & Keegan. 5-8 p.m. Free. Fridays, Saturdays Tim McLemore. 6-9 p.m. Free. 3/1 Dave Williams. 4-6 p.m. Free. 3/8 Dahlby & Nadine. 4-6 p.m. Free. 3/15 Geoff Clark. 4-6 p.m. Free. 3/22 The Neilson Project. 4-6 p.m. Free. 3/29 The Jameson Duo. 4-6 p.m. Free. 4/5 John Mieras. 4-6 p.m. Free. 4/12 Dahlby & Nadine. 4-6 p.m. Free. 4/19 Jason Hicks. 4-6 p.m. Free. 4/26 Roy Dearen. 4-6 p.m. Free. 5/3 Ro. 4-6 p.m. Free. 5/10 Dahlby and Nadine. 4-6 p.m. Free. 5/17 Idlewhile. 4-6 p.m. Free. 4/19 Steve Selinsky. 6-9 p.m. Free. 3/2 Mardi Gras Bash w/”Krewe De Groove. 811 p.m. Free. 3/8 Winger, Immortal Synn. 6:30 p.m.-midnight. $25-$250. 3/9 Albert Castiglia, Austin Young Band. 811 p.m. $18 3/10, 4/14 Swing Night Supper Club w/The Flatirons Jazz Orchestra. 5-7 p.m. $. 3/15 Danielle Nicole. 8-11 p.m. $20-$27. 3/16 Dorado Album Release, Weatherbee. 811 p.m. $8-$10. 3/21 Sugaray Rayford Band, Funk Knuf. 6:30 p.m.-midnight. $20-$26. 3/22 Face Vocal Band, 5280 A Capella. 7:30 p.m. $20-$27. 3/23 Mr. Majestyk’s 8 Track Revival. 8-11 p.m. $15-$23. 3/29 Project Foreigner, Paradise Theatre. 7:3011 p.m. $12-$18. 3/30 Chris Duarte Group, Michael Hornbuckle Band. 8-11 p.m. $22-$32. 4/5 Last in Line. 7 p.m. TBA. 4/6 Damage Inc., Motahead, Maiden Denver. 7-10 p.m./11 p.m.-2 a.m. $15-$100. 3/6, 3/13, 3/20, 3/27 Wintery Wednesday Concert Series w/Coal Creek Music. 6-9 p.m. Free. 3/28-31 Last Minute March. 10 a.m.-4 p.m. SOLD OUT. 4/6 WLC2 Scapbooking Event. 9 a.m.-8 p.m. $. 4/11-14 Outlander Weekend. $140. 5/16-19 “MAY-be it’s Time for a Retreat!” Weekend Retreat. 10 a.m.-4 p.m. $145. 3/28 Buffalo Commons. 6 p.m. Free. 3/4, 4/1, 5/6 The Dev Sessions: Rialto Open Mic. 7:30-9:30 p.m. Free. 3/16 Adam Agee & Jon Sousa. 7 p.m. $22-$26. 3/21 Face Vocal Band. 7:30 p.m. $25. 3/23 The Hit Man. 7:30 p.m. $42-$57. 3/30 George Gray & The Elvis Experience Band. 3 p.m. $15-$22. Mondays Arts & Crafts. 9 a.m.-noon. $. Saturdays through 3/30 Zentangle Method Session 2. 9 a.m.-noon. $180/six weeks. 3/5, 4/2, 5/1 Open Sewing Lab. 10 a.m.-1 p.m. Free. 4/10 Scrapbooking for Beginners. 5:30-6:30 p.m. Free w/registration. Tuesdays-Sundays through 5/24 at Historic Teller House. 10 a.m.-4 p.m. $5-$6. Tuesdays-Sundays through 5/24 at Central City Opera House. 10 a.m.-4 p.m. $5-$6. Tuesdays-Sundays through 5/24 at Thomas House Museum. 10 a.m.-4 p.m. $5-$6. 4/3 Wednesday Lunch Book Club: “The Opposite of Woe: My Life in Beer and Politics.” Noon. Free. Fridays Fish Fry-day. $. 4-9 p.m.
121 N. Jefferson St. • facebook.com/eatatneds Sundays Service Industry Night Specials. 6 p.m. $. Mondays, Wednesdays Luncheon. Noon. $. 3/7, 3/28, 4/4, 4/25 at Nederland Community Center, 10 a.m.-noon. Free. Saturdays at Nederland Community Center. 10 a.m.-noon. Free. 3/3-5 Mardi Gras Celebration w/Cajun Menu & Seafood Boil. 4-9 p.m. $. Sunday-Saturday Famous “Happiest Hour.” 46 p.m. & 8-9 p.m. $. Thursdays Dempsey Fox Duo Jazz Night. 6-9 p.m. Free. Saturdays David Berg Piano & Song. 6-9 p.m. Free. 3/4, 3/18, 4/1, 4/15 Lodge Meeting. 6-7 p.m. Free. 3/30, 4/27 Yard Sale. 8 a.m.-Noon. Sundays Bingo. 6-7:30 p.m. Free. Mondays Monday Bowling Special. 11 a.m. $1. Tuesdays Two’fers Specials. 6 p.m. $2. Wednesdays Ladies Night. 6 p.m. $. Thursdays Thursday Night Unlimited. 6 p.m. $6. Fridays Locals Appreciation. 3-7 p.m. $. Sundays Sunday Funday. 11am, $10. Sundays Vinyasa Yoga. 4-5 p.m. $5-$9.25. Mondays Vinyasa Yoga. 6-7 p.m. $5-$9.25. 3/1 Community All Levels Yoga. 6 p.m. Free. 3/16, 4/20 Dances of Universal Peace. 4-6 p.m. $10. Sundays Sacred Flow. 9-10:30 a.m.-noon. $. Sundays Zen Meditation & Study. 6:30-7:15 p.m. $15. Mondays Holy Yoga. 10:15 a.m. Donations. Mondays Yoga Basics. 6-7 p.m. $15. Mondays, Thursdays Yoga for Strength. 8:309:30 a.m. $15. Tuesdays, Fridays Vinyasa Yoga. 8:30-9:30 a.m. $15. Tuesdays Yoga for Relaxation. 6-7 p.m. $15. Wednesdays Dynamic Fundamentals. 8:309:30 a.m. $15. Wednesdays Pilates. 10:30-11:30 a.m. $15. Saturdays Sacred Flow. 8-9:30 a.m. $15. 3/2 Intro to Essential Oils. 1-3 p.m. $30 w/registration. 3/11 at Estes Park 18-Hole Golf Course. 1-3 p.m. Free. 1480 Golf Course Road. 970-586-8146. golfestes.com WHY DO WE NEED BEES? 3/15 Ninja Night. 6-8 p.m. $10-$12. Sundays Pilates. 1:30-2:30 p.m. $5-$9.25. Mondays Pilates. 8:15-9:15 a.m. $5-$9.25. Mondays Cardio Madness. 5:30-6:30 p.m. $5$9.25. Mondays, Wednesdays, Fridays Aquacize. 9:3010:30 a.m. $5-$9.25. Mondays, Wednesdays, Fridays Adult Strengthen, Stretch & Balance. 11 a.m.-noon. $5-$9.25. Tuesdays Quick & Tone. 8:15-9:45 a.m. $5-$9.25. Mondays, Wednesdays, Saturdays Morning Pickleball. 10 a.m.-Noon. $. Mondays, Wednesdays Evening Pickleball. 6	8 p.m. $. Mondays-Thursdays Fitness Place Open. 8 a.m.8 p.m. $. Tuesdays Adult Basketball. 6-8 p.m. $3-$4. Tuesdays, Thursdays Zumba. 6-7 p.m. $3-$4. Wednesdays Cardio Sculpt. 8:20-9:30 a.m. $3-$4 Fridays Fitness Place Open. 8 a.m.-7 p.m. $. Fridays Women’s Morning Pickleball. 8:3010:30 a.m. $. Sundays Sunday Funday Specials. 11 a.m.-10 p.m. $ Mondays Monday Bowling Special. 11 a.m. $1 Tuesdays Two’fers Specials. 6 p.m.-midnight, $ Wednesdays Ladies Night. 6 p.m.-midnight, $ Thursdays Unlimited Bowling. 6 p.m.-midnight, $ Fridays Locals Appreciation w/Happy Hour & Appetizers. 3-7 p.m. $. 3/25 Build Your Body w/Bands. 6:30-7:30 p.m. $10. Mondays Boot Camp. 6-6:50 a.m. $. Mondays Zumba Gold. 10:15-11:05 a.m. $. Mondays Open Gym. 6-8 a.m./11:30 a.m.3:30 p.m. $.